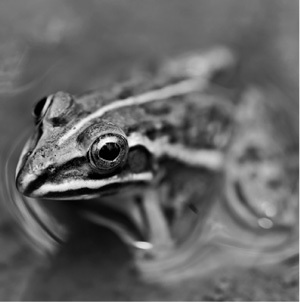 Why must amphibians stay near water or moist environments? Although amphibians breathe air and walk on crude legs—for example, alligators—they cannot stray too far from water. This is because they need to lay their eggs in water, and their larval stage needs water. For example, frogs and toads start their early life as eggs deposited in water (or near water), then develop into tadpoles—they must live in water to survive. At the adult stage, amphibians can either be amphibious (live on land and in the water) or totally aquatic, with some exceptions: For example, some species of frogs live only on land (but in a moist area), and some are more common in arid regions. For example, some desert amphibians store water in their bladders; they wait for cyclic rains (such as the Arizona “monsoon” season), then use the resulting water puddles to reproduce. Amphibians like this frog must stay near the water to live because their eggs can only survive in a wet environment.